What Did You Drink Today (non-wine) #1? Happy hour was a negroni, easy as 1 oz gin, 1 oz Campari, and 1 oz sweet vermouth. Served over ice with an orange slice garnish. 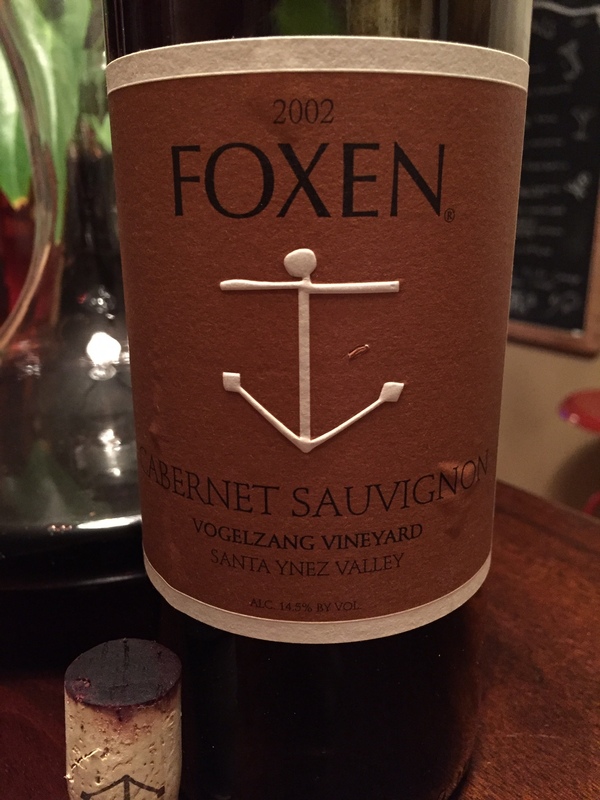 With dinner we crossed our fingers and hopped this forgotten 2002 Foxen Cab would still be drinkable. It was good, but not great. Yesterday it was a few Estrella’s, a few ciders, followed by a bottle of vinho verde and blue fish Riesling - the latter two polished off with 2 friends in the lobby of the conference hotel, as the bar was long closed. Today only tea and coffee. Yesterday was 4 bottles of Sol and a bottle of Becks whilst bowling with friends. The beer choice was very limited. Things improved when we went to a food market. Can of Adnams Ghost Ship and a can of Beavertown Neck Oil IPA. Couple of glasses of prosecco when we got back home with dinner. Seems a lot when you write it down. Milk. Probably not what you were looking for, LOL! I will probably make myself a Black Rum Cider this evening however. That is my name for hot apple cider (the real stuff, not apple juice) with a healthy dollop of Captain Morgan’s Black Spiced Rum. Kraken won’t do. Capt. Morgan’s version is smoother and much, much tastier IMO. Maybe I’ll top it off with some whipped cream, even. We like to do a cocktail du jour on weekends. 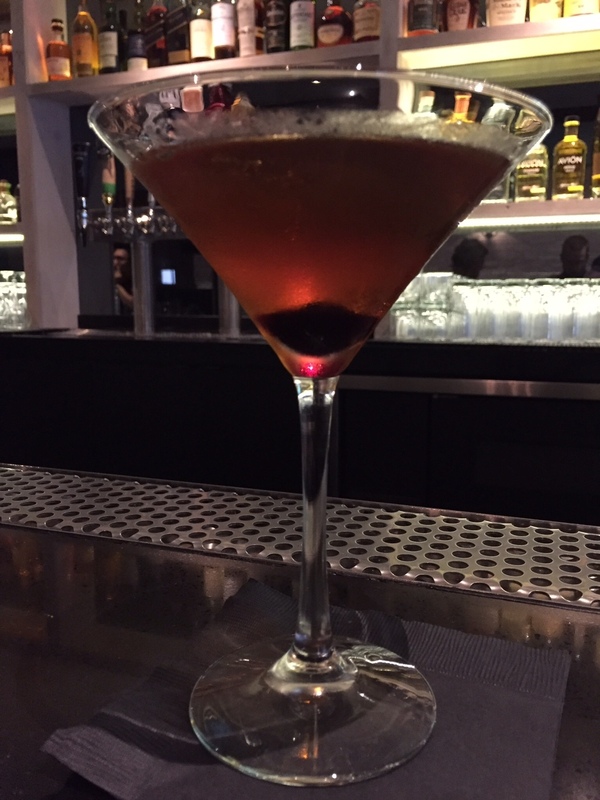 Yesterday it was cold and rainy and just miserable, so it was a classic Manhattan in front of the fire. Ok, maybe it was 2 classic Manhattans. Today it was just gray and chilly, so we went with crantinis. To make 2: 3 shots vodka, 1 each of dry vermouth and triple sec, 6 oz cranberry juice. Friday evening i stopped into a nice bodega/corner deli and discovered my new favorite thing, Crabbie’s ginger beer!! The catch is that was in a neighborhood i’m never in so i have to source it closer to my apt asap. Last night was a glass of prosecco and a glass of vino verde with friends. Tonight we had a Coffin Varnish (rye with a few dashes each of rhubarb, grapefruit, and peychaud bitters), and a Manhattan. CV pictured. Had an “El Diablito” at my current favorite haunt in Philly: mezcal, tamarind, lime, heat, while my man had a “Czech Pilot” - Becherovka, Amaro, clover honey, lime. Followed by 2 Clinks for da man & a Gaffel Kölsch for me. Now we’re back to “Twin Vines” vinho verde for a ‘nightcap’. last night i polished off, all by myself, a bottle of a new-to-me Italian red - gutturnio. lovely, cherry-ish, mellow. that was over the span of dinner and 3:00 a.m., just to try to justify myself. oh and two glasses of sangria at a taqueria for lunch. today, nada, so far (well, nothing since 3:00 a.m.) i just replenished my stock of Campari, so negronis are in the horizon, but tonight, for a late(ish) nightcap with the BF, it’ll be margaritas, at our local bar/pool place, with cheapo Cuervo Gold tequila, on the rocks, no salt. it’s been my late summer drink for weeks now. Last night – a tall glass of Canada Dry Diet Ginger Ale over ice paired with Chinese take-out. Why do I love that stuff??? While we were making dinner, DH and I shared a Golden Road ‘The Works’ IPA. With dinner we had a glass (or two) of Portalupi red table wine. for both. I sipped on one of these the other night at a local place I consult to, after a hard day of fine tuning the new Fall cocktail menu. I created it a few years ago and it’s called Lolo Ono, which means crazy delicious in Hawaiian. 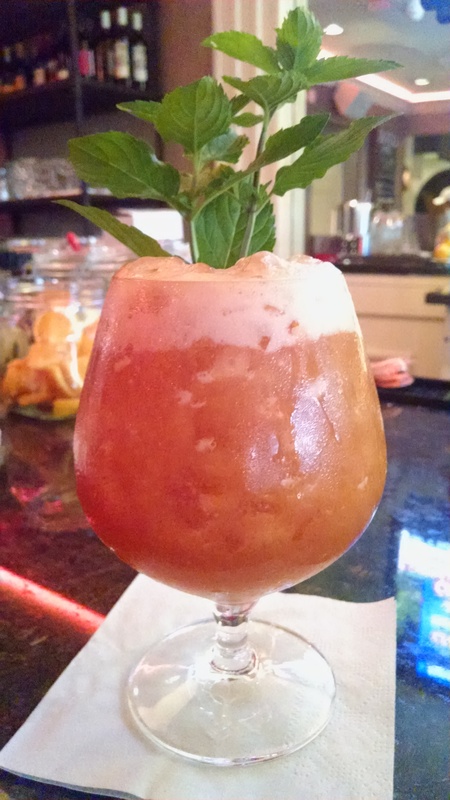 It’s made with a blend of Demerara and Jamaican rum, Lime juice, Orange juice, house Ginger syrup, house Vanilla syrup, house Cinnamon syrup, Angostura bitters; shaken and garnished with mint. It’s been a best seller ever since it went on the menu and can’t be taken off or customers complain. Last night I sipped on one of my favorite cocktails both to drink, and that I created. 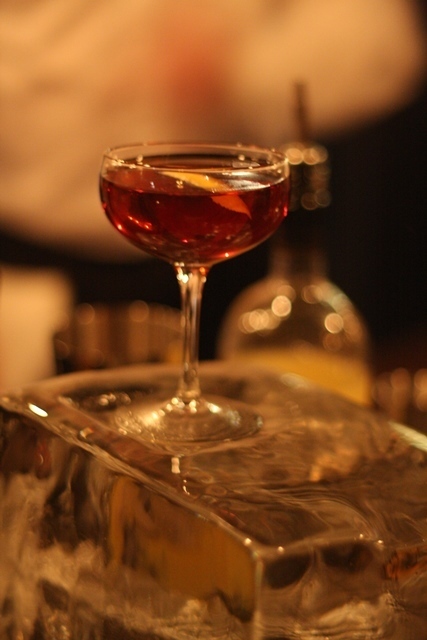 It’s called the Gotham, and is on the menu at several cocktail bars in the NYC area, including the Harvard Club NY in Manhattan. It’s made with Rye whiskey, Carpano Antica Formula sweet vermouth, Benedictine liqueur, Cognac, Angostura bitters, and my own special bitters. Last night I had an Old Fashioned made with fig infused rye, a tiny bit of brown sugar, and walnut bitters. DH had a Manhattan that got a splash of chartreuse. Both drinks had a very nice fall twist to them but were close enough to the original to make us happy. Oh, forgot to add about the Lolo Ono cocktail. This cocktail was at Burrata, Eastchester, NY. In lower Westchester County, just 5 miles outside the NYC border. JMF, we were at a new place call LUKE in Woodland Hills, CA. I’m loving your posts and expertise…can’t wait to keep reading and learning. I’m totally going to make some custom bitter sugar cubes soon. Moving this thread to spirits because this thread becomes orphaned when I closed off posting to the Drinks main category. I know we aren’t just drinking spirits, so perhaps a thread for ‘what wine did you drink’, etc. that is separate from this thread? Thanks. Thanks HO! I wondered why I could not post here anymore. I’ll keep this thread in Spirits and see about a few more for wine etc. Saturday night we hung out at a nice bar, and enjoyed a martini and an old fashioned. 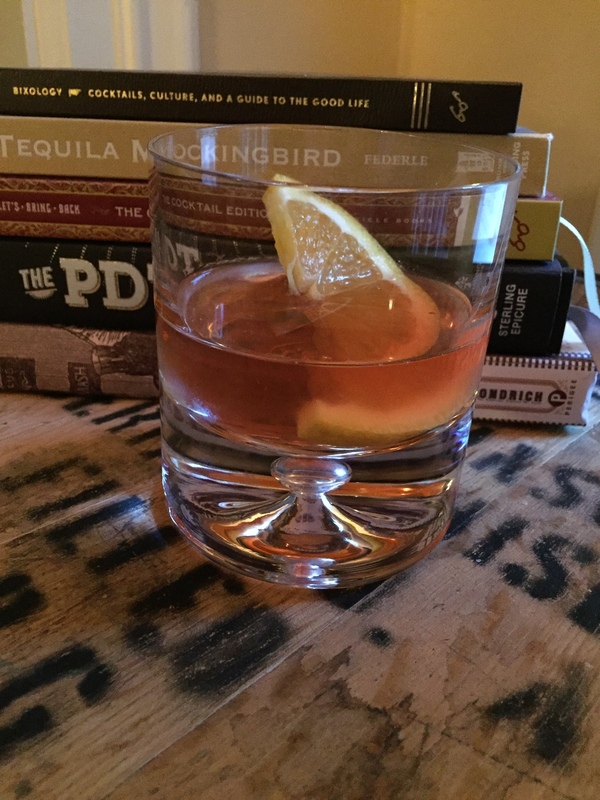 My issue with old fashioneds is that they are often poorly made, too sweet, and sometimes what I get looks like the bartender muddled a bunch of jarred fruit cocktail in a glass. Blah. But, these were really good, no fruit in sight, and used a nice strong rye whisky. Tonight is our night out so I’ll try to find something new to report on.